The perfect make-ahead appetizer for entertaining, this seafood salad is made with a combination of shrimp, scallops, mussels, fresh tomatoes and basil. The Golden Globes are tomorrow night which means one thing: Award Show Season is finally here! After a year packed of movie watching, we can finally see what movies are on the road and destined for Oscar glory. I always try to see most of the movies nominated in the award show season circuit and this year we have a great crop of films. We’ve got some of the big guys back this year, Scorsese with Hugo and Spielberg with Warhorse and Tintin. I’m going to see Hugo in a couple of hours, but I’ve seen Warhorse and it was just beautiful. It should be a strong contender for the cinematography awards. I highly recommend it. I always love to have some delicious food while I watch the big show, and this year one of the dishes I’ll be enjoying is this seafood salad. This is a recipe that my mom has been making for years and it’s a delicious, fancy and fresh appetizer. If you’re looking for something a little more indulgent, you can make my easy stuffed mushrooms – but I think this seafood salad is much more suited to The Oscars. The best thing about this recipe is that it can be prepped a day in advance because the seafood will marinate in the dressing and soak up all the flavour so it’s even better on the second day. Have you seen any great films this year? The Help (just won 3 Critics Choice Awards) was one of my favourites. A beautiful story was turned into a film that had all the right notes. I laughed and cried, was angry and happy, and in the end, I emerged from the theater seeing some awards on the horizon for Viola Davies and Octavia Spencer. And then Meryl shows up. It’s going to be a tight race this year, with the ever amazing, and my favourite actress, Meryl Streep as Margaret Thatcher in The Iron Lady. But that’s just the tip of the iceberg in the race for Best Actress. The Golden Globes will be a great precursor to who is going to get those coveted Oscar nominations, I’ll bet on Meryl getting a nomination. She’s an Academy favourite, she’s had 16 nominations. I won’t even touch on Best Actor. How someone can pick between Clooney, DiCaprio, Gosling and Pitt is beyond me. They are all my favourites. With special attention going to Leo and Ryan. We’re on a first name basis. Yep…I wish. Alright, enough blabbering about film, let’s get to the recipe. So here’s the deal. I love to host Oscar parties. I spend hours picking out my Oscar menu, the way some spend hours picking out their Superbowl menus. This year I have six recipes to share that I will be serving at my Oscar party, and I will be posting them weekly up until The Big Night; along with some thoughts on the race, the films and of course the style! The first recipe in the spread is a Seafood Salad, a little fancy and delicious. In a large bowl, whisk olive oil with garlic, lemon juice, red wine vinegar, parsley, basil, sun dried tomatoes, capers and hot chili flakes. Heat olive oil in a large over medium-low heat. Add the red peppers and cook for 5-8 minutes until softened. Add the raw seafood medley to the pan and continue cooking with red peppers for 5-7 minutes.Remove from heat, pour into the prepared bowl. 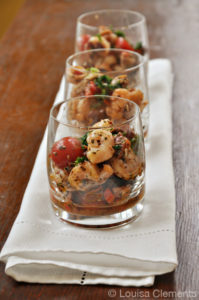 Add pre-cooked shrimp, tomatoes and olives.Toss with dressing. Cover and cool in the fridge for at least 2 hours. Who else is planning on throwing an Oscar party? Let me know if you give my seafood salad a try. Looks amazing - cannot wait to try!! This looks soooo "yummy"...Love all of the ingredients too! the recipes are very unique wow! and looks absolutely delicious!